Finally, a set of the case with changes is on the way to me. It has EVERYTHING included (so we'll get to see the final logo aluminium plate as well). Once I've received it (I don't know which courier they used to ship it, so I have no clue yet when they will arrive), we will find out whether all the remaining issues have been taken care of. So basically: The stylus holder and the shoulder buttons and a few more smaller tweaks. I'll do an unboxing video once I receive it - and we'll find out right away how it turned out! Let's cross our fingers that the case odyssey will then be over! Nikolaus received the test PCBs last week and populated them with the new power circuit right away. 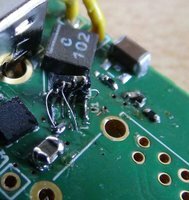 It didn't work at first, as he accidentally got a power converter that couldn't handle 5V (yes, such things can happen) but it only took 2 hours to find the correct chip and only one day to receive it. The USB port is working fine (we tested data and voltage) and the PCB remains totally silent! Whatever power we draw from the USB port, no noise can be heard and the voltage stays totally stable. The PCB layout data has already been updated and sent to Global Components to start the production for the prototypes! All known issues of the CPU Board, the Display Board and the Mainboard have now been fixed. If the case is fixed as well... well, then that's it. Can you believe it? I can't. But let's not do the happy dance yet - let's wait for the prototypes to be finalized. As soon as I place the mass production order, we can do the happy dance! kedo, Skin-nl, Kazuki and 76 others like this. el joker and error like this. I wish I could like this 100000 times.. but you told us not to do the happy dance yet. FBnil and error like this. Do you have tracking or anything for the cases? Hopefully they don't get crushed again. Amazing! Happy to see it all come together. I'm so ready for my Pyra! This sounds perfect...Time come near. It's not ready until it has been properly tested, validated and verified, but it would be great if we can finally close the case of the cases. I am very glad that a good solution has been found. The progress sounds very promising. Thanks for the update. funkyarif, el joker, Djhg2000 and 2 others like this. @EvilDragon Now we only must wait for the CPU board from the chinese manufaturer and test the fix for 4GB RAM?? assuming that the case will be ok.
Is that a temporary solution for making it fit, or will the final devices have to be wired up like that too? But let's not do the happy dance yet - let's wait for the prototypes to be finalized. But I had my happy dance pants on already! Very promising news all together though! I guess fixed CPU board prototypes can start to be queued for production now most chinese factories are back from their new year holidays. I know the fancy industry standard simulation said they'll all work with 4GB RAM now, but I'd appreciate news of them physically working. @silent_hunter That photo is very much a hack it together job to see it working. As explained in the news post, new layouts have been sent to GC already which will incorporate proper implementations of that bodge. looking forward to my pyra! ROFL - I thought it was just me that ended up doing stuff like that ! That's good! I figured that was the case. Neelix and skeezix like this.